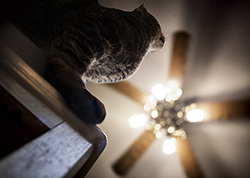 Our return policy is very simple and allows you 90 days to return your purchased products for ANY reason at all..If the cat does not like the ceiling fan that is fine...just contact us at help@CeilingFanDirection.com.... any reason...just email us! If it has been more than 90 days unfortunately we can’t offer you a refund or exchange but the original terms of the lifetime motor warranty do still apply. Once your return is received and inspected, we will send you an email to notify you that we have received your returned item and then your refund will be processed, and a credit will automatically be applied to your credit card or original method of payment. If you haven’t received a refund yet, first check your bank account again while remembering that it can take a couple of days to be reflected on your statement. If you still have an issue after we have processed your refund contact your credit card company or PayPal. We only replace items if they are defective or damaged and will do so at our expense. If you need to exchange it for the same item, send us an email at help@CeilingFanDirection.com for assistance. To return your product you should first contact customer service at help@CeilingFanDirection.com for a return authorization number. This is just so that we can be sure to track your return and credit you back in a timely manner...remember we take back items within 90 days for any reason at all! You will be responsible for paying for your own shipping costs for returning your item. If you are shipping an item over $75, you should consider using a trackable shipping service or purchasing shipping insurance.